I have read this series in an unorthodox order. 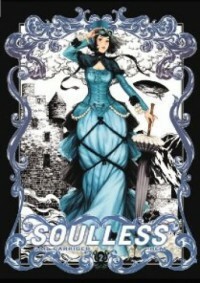 I first read Soulless the Manga, Volume 1, then found out it was the same as the book series the Parasol Protectorate. I read that whole series and have finally rounded back to the manga. This volume adapts the story of the second book in the series, Changeless, in which the supernatural find that their powers have been mysteriously disappearing. The phenomenon only lasts a night in London, but appears to be making its way northward. I enjoyed the book and the manga doesn't stray far from the source material. I felt it captured the book's essence and feeling as it did with the first manga volume. I think I do prefer the actual books, since there is a lot of background and inner thoughts that you don't get in the manga. I also didn't love character design for Madam Lefoux and I had been looking forward to that. The series is great, but I think I would recommend the books, then the manga.